Housed within the quartet that is A New Revenge is a metric ton of talent and experience. By that standard, most would hail them as another “supergroup,” though they would be quick to disabuse you of that notion. They are just four guys who happen to love making great rock and roll, and their resumes demonstrate that they have a knack for doing it well. That passion has culminated in the band’s long-awaited debut album, Enemies & Lovers, released March 29th on Golden Robot Records. 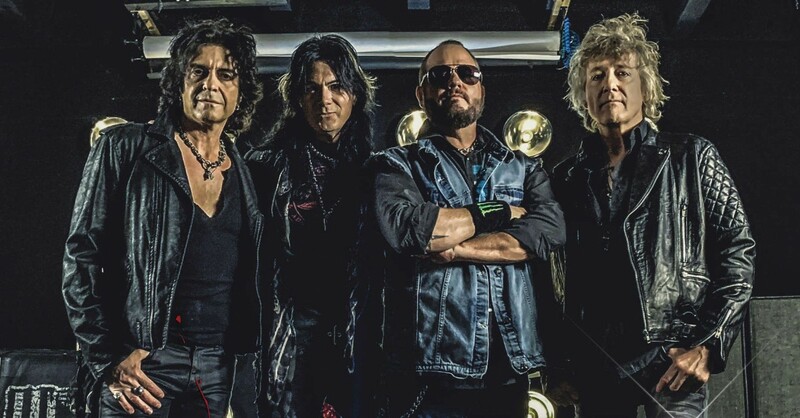 The germination of what would become A New Revenge began as Project Rock, the brainchild of guitarist Keri Kelli (Night Ranger, Alice Cooper) and former Scorpions drummer James Kottak. Powerhouse vocalist Tim “Ripper” Owens (Judas Priest, Iced Earth, Spirits of Fire, The Three Tremors…) found himself recruited into the fold as well, and a series of shows were staged in Russia, where the band played songs from their various bands. Over time this began to morph, with Kelli writing riffs and song ideas down and sending them over to Owen, who in turn began to craft vocal melodies. With Mr. Ubiquitous, Rudy Sarzo (Ozzy, Dio, Whitesnake,…) also on board, the quartet recorded their debut record, Enemies & Lovers. The album’s sound delivers an infectious blend of vintage hard rock with a contemporary heavy sound and modern production. On the album’s release date, Metal Nation caught up with Keri Kelli in Las Vegas while on tour with Night Ranger. We spoke about the band’s formation, the direction of their music, and the debut album, Enemies & Lovers. Tell us a bit about the writing process for the record, because this is really the first time you’ve had a chance to spread your wings in that regard. Did you and James have a vision in mind for the sound of the band, or did that just develop as you started writing? I spoke with Tim a few weeks ago about all 3 of his current projects, and I have to say of everything he’s ever done, this one really showcases the diversity of his vocal abilities. He’s not just out there howling and wailing, he’s showing all of his versatility. The first single on the record “The Way,” is a pure ripper but very addictive. And you can feel that Kottak rhythmic groove. Tell us a bit about that track and why you chose to put that out as the first taste of the band. One of the songs that jumped out at me was “Only The Pretty Ones.” It reminds me a bit of something your former boss, Mr. Cooper might have done. You can listen to the full interview with Keri Kelli below as he talks more in-depth about A New Revenge, Enemies & Lovers, and his craft beer franchise, Aces & Ales.